I’m still on my mission to try out different types of beans in an effort to get good quality protein without having fish, chicken or meat every day. My kids love thin crispy potatoes that I make in the oven. I’ve done a how-to-video HERE but instead of olive oil I used coconut oil to make it a bit healthier. potatoes: 1.Pre heat the oven to 210°C. 2. Cut the potatoes thinly.Boil until al dente. (about a min), drain really well. 3. Heat a large oven dish with coconut oil in the oven. When hot place your sliced potatoes in season and put in the oven for about 45minutes. Turn the potatoes if needed. 4. Season with some Black lava salt or other good quality salt and a knob of butter. Bean Mix: 1.Fry a finely chopped union and garlic in coconut oil, add basil and cummin to taste. 2. cut the peppers and add to the pan. 3. Add the pinto beans and stir. 4. When the mix is thoroughly heated serve on top of the crispy potatoes. Squirt a few drops of lime on top. 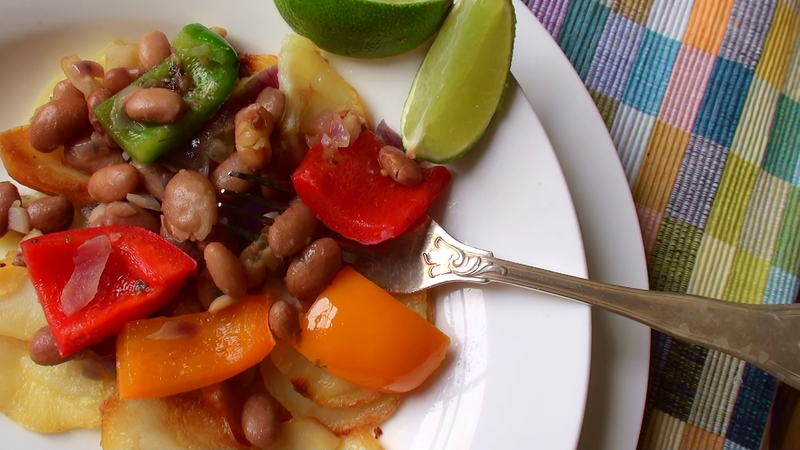 Pinto Beans are not only a good source of protein, they are also packed with other good stuff like soluble fibre, folate, magnesium, potassium and molybdenum to name a few.